Good afternoon, everyone! I’m still on vacation, so I can’t update the header to give you spoilers there (I really should put my FTP program on laptop at some point), but fear not. I have them and they’re good. The path to a BB12 repeat took a sharp turn recently when the group decided to vote out their version of Brittany (Christine) earlier than expected. Instead of using Christine, they were set to take Victoria to the final 5 and then cut her loose for a big battle of 4 strong players. All of that changed when Derrick slowly realized he would have been going into a gun fight with a pellet gun. Don’t get me wrong, Derrick has won his share of competitions, but if he really wants to win $550k (+50k for being TA), he had to cut away some of his competition before the gun fight began. The reset button gave Derrick that opportunity when Frankie went from having all the power to absolutely no power and sitting on the block. It was time to make the move and Derrick & Cody knew it. They may not get an easier shot at removing him from the game when it came down to the final 4, so they made the smart move and cut him (and his many competition wins) from the equation. Caleb instantly became the next target, and that was made clear by nominating him against Victoria. Caleb can still stay in the game, but that rests in the hands of Cody – who won the PoV. Cody does not have the same loyalty to Victoria that Derrick has, but he also isn’t stupid. If Cody keeps Caleb in the game, the final HoH competition will be brutal. The first round is likely the endurance competition (which should air on Friday), and if I had to go against Victoria or Caleb, I’d choose Victoria. By going against loyalty, Cody will have a harder time winning the grand prize if he’s in the final 2, but if he remains loyal, there is a solid chance he won’t make it to the final 2. The veto meeting should happen live tonight, but I don’t expect him to use it. It’s a $50,000 gamble that I don’t think he’ll be making. The big question will be who Derrick would take to the final 2 should he win the next HoH. I will try my hardest to live blog the show again tonight. It starts at 8pm est, so only 3.5 hours away. Do you think Cody will use the PoV and have an all-guy final 3, or take the path of least resistance? How would that work ? If Cody uses pov, then is Vic the only one on the block ? In any case, if Cody saves Caleb, then I think Derrick would take that as a threat. And Derrick would probably take Caleb to final two if he wins next hoh. The way I understand it is that if he uses it, Victoria is automatically out because there’s no one else to put up. so why is there a POV to be won if it can not be used? It is played so whoever is on the block at this point in the game can still save themselves. In case the ones nominated won they would remove themselves from the block. Since either of them won the POV is irrelevant consider Cody has sole power to evict Caleb or Victoria. I thought the exact same thing Monica, but I believe that BB “had” to give Caleb the opportunity to save himself by playing for the Veto. No Trudy. If Cody used the veto on anyone say Caleb then Victoria goes home. There is no more voting at this point. That’s not true. There MUST be 2 nominees on the block. Cody is not allowed to use the Veto. Ok so using the veto would be superfilous (? )because he has only vote so either way who he chooses goes home seems stupid to say he’s using on Vic when he just votes Caleb out. I don’t consider that using veto. Doesn’t make sense. At the end person with veto just voted for who they want out. Cody won’t use the veto. But he has the only vote, so he could send Victoria home instead of Caleb. But really doubt that will happen. Hey DMC, If memory serves, in past years, if the one person that is not on the block chooses to use the Veto, they do not have safety. So basically it would require him to pull down Caleb to put himself up. So it’s not that he CAN’T use it, it’s that no one would. Hope you are doing well. See you back here next season. I don’t think Cody will use it. Its a tough situation for him to be in right now. I mean, he could use it, and piss off Derrick AND have tougher competition in the final comp IF he’s still there, or not use it and have Caleb pissed and potentially lose a vote (or several) from the jury. Hmm..guess we’ll have to see…should be a good one! 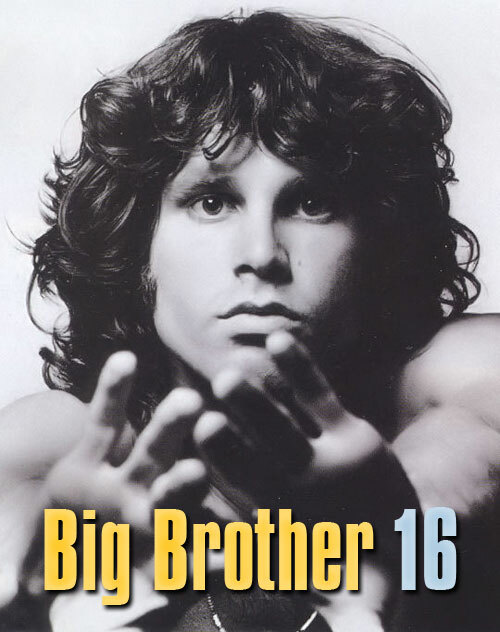 Derrick’s name has been on the Big Brother check since week 3. They’re obviously too lazy to even consider cutting a new check for a different winner. Oh, and my above comment is an opinion….not a fact for anyone concerned. Stevebeans: If Cody is still under the thrall of Derrick, he will be persuaded to evict Caleb and keep Victoria. Derrick assumes this move would be a win-win situation for him as he is confident Victoria would take him to the final two if a miracle occurred that put her in the position of having to choose. I agree that Cody realizes keeping Caleb would result in a hard fought battle and he may be looking to eliminate that aspect. I tend to think that both Cody and Derrick are viewing Victoria as their ace in the hole. She’s easy to win against if she’s sitting next to either one of them in the final two. Monica, I also doubt that Cody will be sitting next to Derrick at the end. Whoever wins the last competition will be taking Victoria. Derrick has used everyone in that house for his own purpose. I don’t believe he has any loyalty or sense of obligation if it comes down to his keeping Cody. As for Victoria winning over Cody, it’s possible because she has absolutely no blood on her hands either. She is, however, in the eyes of the jurors, a floater who happened to get lucky because she clung on the right person. She could be rewarded for that reason alone. But Cody has blood on hands (understandably) and has won several competitions. If voting on the merits of gameplay, I think Cody would win over Victoria. Anita. I think Derrick plans to take Cody and Cody plans to take Derrick. 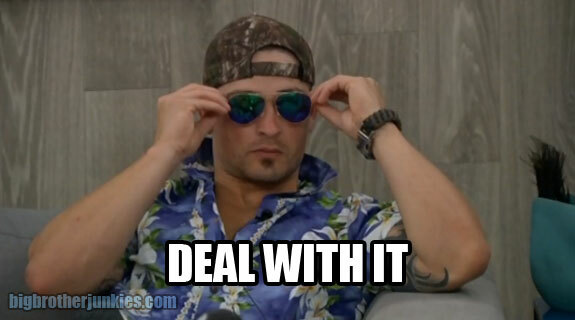 But I don’t have any respect for Cody’s game and I think Derrick is sure he can beat Cody in jury. On the other hand if Cody does the picking he would be crazy to take any chance at all and here is when loyalty stops Derrick May have him convinced he has no jury votes but if Cody believes that he’s dumber than I thought surely he would not take chance and take Derrick when even he has sure vote against Vic? You think? Really, Franko , so nice to have met you and others. You all touched my heart!! Thanks steve b and wife! Made a sound and he changed his mind, so I think Cody should have won the last head of house. This was the …before / after game. It would be real funny if Vic. Won. And it was mean the Vic’s name was scratched out in the door. Bye, mom. It’s been a fun summer with you as well. Hope all is well with you & yours. Take care. Bye mom. Hope to see you next year. Love to you and yours. I hope everything is ok for you. I do know you have some really ruff things going on in your life I just hope you and your daughter are ok. Have a great winter and see you back next BB season. bye its been fun. you will be missed. Yeah, I also think Cody should have won the final HOH! It was REALLY shady! I can’t believe more people aren’t complaining! Looks fixed to me! Yeah i also heard the audience moan when Derrick did that which to me clued him in that his answer was wrong. I even thought Julie was gonna say something but she didn’t. Who knows maybe tonight they’ll have a do over, but I doubt it. In all fairness it should be done. Although I think Derrick is a much better player than Cody, it’s just fair to the ppl who were playing. I hope you’re not letting negative comments on here when you off! Thank you very much for your comments to me over the past few weeks. it has meant much more than you know. I haven’t been posting much in the last few days either because I didn’t want to hear the negative comments about personal stuff. I have missed my buddies that I’ve made on here very much. You take care of yourself and your family and I hope to hear from you again. I have to consider what Cody said and think of this as a game of chess. Vic then, would be considered an isolated pawn. An isolated pawn is a pawn that has no friendly pawns to help them against attacks. Therefore, the square in front of an isolated pawn indicates a weakness because the isolated pawn cannot move out of its present location. This weakness can come back and haunt the King (Derrick), particularly if the Kings and only the pawns remain in the game. This might be a good time to trade off the isolated pawn. If they aren’t careful Victoria will be there at the end and they may give her the money because everyone else forgot to vote her out! If Cody goes to the end with Victoria she may actually have a small chance to win…. I doubt that because then everyone in the BBH this season would b all time idiots !! Seriously, the girl was useless the entire game !! Isn’t Cody’s win of the POV at final 4 effectively make the POV void? Caleb and Victoria on the block. Cody is safe as POV holder. To use it, there is no replacement nominee because everyone is either safe or nominated. Thus Cody can’t use it. Had Caleb or Victoria won it, it could be used because Cody could have gone up, but since that didn’t happen the POV must be NULL by rule. It’s now a matter of whether Cody will keep Caleb or Victoria. Odds are to keep Victoria so the HOH competition is just effectively Derrick and Cody since Victoria couldn’t wind a one person race. Come on Zombie Cody Play YOUR GAME! not Derricks, keep Caleb quit listening to Derrick. Man Cody’s brother will be laughing at him when he gets home. Ya tired of your car payments, want to take a vacation, call your Bro Derrick maybe he can spot ya a loan, LOL….. I think that is why Derrick should use Caleb’s strength to play against Cody. Cody could end up beating Derrick in a physical challenge, but if Caleb won, he would take Derrick. Getting rid of Caleb may be bad for Derrick’s game. Beastmode had his chance to win this ‘do or die’ POV, I guess he has to ‘die’ isn’t that a ‘Cowboy Code’, put up or shut up. Cody aint smelling nothing but Derricks underarms. When has Cody or Caleb done ANYTHING that was not directed by Derrick. Even when both were about to make their own moves, Cody to put up Frankie, Caleb to put up Derrick, they both followed what Derrick said to do….these guys have no idea how to play BB, they think they do, heck even Caleb thinks he is running the house, LOL….now each one will go home with a shocked look, be laughed at by their buddies and ask Derrick for a loan cuz he will be 550K richer…. Derrick deserves to be a 1/2 Millionaire less taxes of course, and probably ranks in the top 3 BB players of all time. BuBye Beast Mode and Soccer Pretty Boy, its Victoria and Derrick at the end…all smiles as this is one of if not the worst BB in history. Its a reality show aint it?? REALLLY????? did you just go there with that comment you made? I mean really? Fruits and chix, REALLLY??? that comment is very offensive! it is not worth my time! “You called yourself a social media mogul. Explain what that is. Did Mango also mention that having a semi-famous half sister also help with his social media hits? I knew he had signs of a Disillusionire disease. Cody will do whatever Derrick tells him to do just as he has all season. Would have been a much better BB if Cody had done what he wanted and got freaky Frankie out early on. Or the clear shot he had at Beast Mode early on, even before Amber was evicted. Think Cody should vote out Victoria. That way whoever wins the final HOH won’t be tempted to take Victoria for an easy win. if Caleb, Derekn and Cody go to the final 3 it will be the best man who wins. no matter who goes up against Victoria it’s a guaranteed win. Where if it’s a contedt between the 3 guys they all have a even chance any of winning. Who ever wins the final HOH,I can’t imagine they would throw away a guaranteed win by taking Victoria to the final two and risk it just for loyalty. I agree Steve. Derrick would’ve had a harder time winning if all four bomb squad members stayed in the game. Derrick knew this and took his shot. Lining up next for a shot at Caleb. Ready,aim, fire bye bye beastmode cowboy you screwed up taking Frankie out. Cody and Derrick have decided ( or should I say Derrick decided ) that Caleb has got to go. Final 3 comp is something Derrick and Cody have been talking about for awhile. Derrick stated to Cody that he would have to win the first comp because he’s not good at endurance. Derrick wins the second decides who is going to the final with him and it’s done. Now I know a lot of people think that Derrick will cut Cody. I don’t. I think he remain loyal to the only person he has been loyal to since week two, Cody. He will have a good example of the control he has had over everyone’s game right there with him. Even Cody will be amazed he was played. Can’t wait for speeches. Didn’t you forget step? Cody wins first. Then Derrick and Vic play and Derrick wins of course. Then Cody and Derrick to see who wins and chooses who to take. Right? If Victoria is beside Derrick in the final 2, she is stupid enough to tell jury members to vote for him.